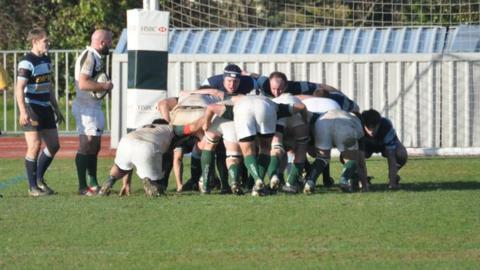 Jordan Reynolds was pleased Guernsey ended their four-game losing streak as they beat Westcliff 19-13. The victory takes the island side seven points clear of the relegation zone although they remain in 10th place in the National Three London table. "It was good to get off that losing streak again," he told BBC Guernsey. "Going four games in a row is a hard pill to swallow. Our performance was in dribs and drabs, but we got the victory that we aimed for." And although it was not a perfect performance for his team in front of their fans at Footes Lane, it was a win which he was happy to take. "We've been through hard times over the past four weeks with injuries, we're not through that, but to get a win, the guys can build on that and focus on the next match," he added. "We probably blew a fair few opportunities to add to our score, but we had it quite safely, and we didn't really finish it off towards the end. "But I'm not going to be too critical of that, it's just important that we got the win."